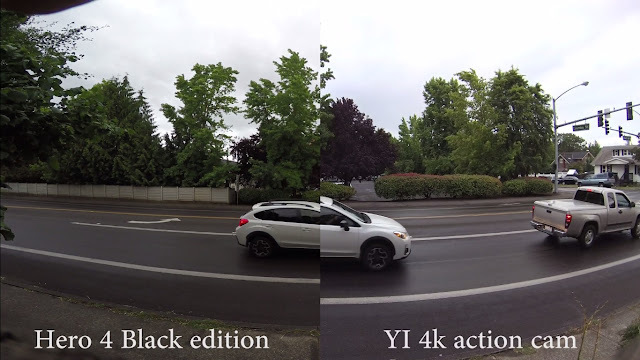 YI 4K Action Camera first impressions and Hero 4 Comparison. The new Yi 4K action camera has created a great expectation between filmmaker community. Cheap, 4K, slow motion and touch screen are some of the features this camera offers for an incredible price. I just received the Yi 4k action cam from my pre-order a few months ago. There was no tracking or now shipping information, it simply showed up. The camera feels well made and the battery is noticeably larger than my hero 4 black edition. The touch screen is very easy to use and very responsive and controls in general are easier to use than a hero 4. Build quality is in the same category as the hero 4 so if you plan on taking it into extreme weather or water, you'll need a case. I'm still on the fence about image quality. I'll post more as I get a chance to test these two cameras out. The hero 4 is getting a run for the money with the Yi 4k action camera, but there are a few trade offs.